For many people, sailing is the ultimate boating, but you can or will not always go under sail. On the other hand, many inner cities and nature parks no longer allow the use of diesel or gasoline engines. The Zijlsloep is intended for whoever is used to sailing in silence. That is the reason we choose an environment-friendly electro-engine for the Zijlsloep, which is allowed in many of these areas. You can even remove all sailing equipment (sails, mast &c) within 15 minutes single-handedly. 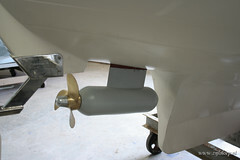 This creates a comfortable and very quiet electro-liferaft. The modern electro-engine is strong enough and small, quiet, does not smell, starts always and is very easy in use: turn the key, forward and reverse without gear changes, fully variable speed. The electro-engine will power the ship many hours at its average speed (5 km/h) but can (almost) reach the ships maximum hull-speed (9 km/h). The engine is an underwater POD type, almost soundless and on-board you need only space for the batteries. Cannot be stolen without a very wet suit (pun intended). The electro-engine is maintenance free. The batteries are recharged in a night, through a regular 230V outlet. Because you intend to sail, you will seldom ask the maximum of a battery charge, which may last for eight hours or more (depending on factors as speed, battery model, ship load). An Euro per day is common for using the engine several hours.